There was never a dull moment in the past few weeks of Miss International 2016. The contestants traveled to so many places and at the same time immersed in the rich culture of Japan. From ikebana lessons to traditional dancing sessions, the experiences that the ladies have had will surely be treasured for the rest of their lives. Miss International has indeed stepped up its game, and is showing to the world that they are truly back on track! Many, if not all, of the contestants developed special bond with their fellow beauties. Camaraderie and friendship across diverse culture is the essence of Miss International after all. On top of that, the various fora aimed at strengthening the role of women in our society did boost the confidence of each and every Miss International 2016 contestant. Such idea was spearheaded by the dynamic owner of the Miss International Organization, Akemi Shimomura of the Miss Paris Group, who has been more visible than ever at this year’s competition. As the finale of the pageant is looming closer by the hour, it is essential to reminisce the previous years’ Hot Picks and how utterly difficult it is to predict the outcome of Miss International. 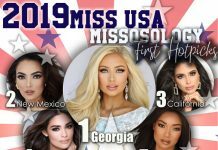 A fair pageant such as Miss International, which has no intention to be influenced by social media trends and demands, is extremely hard to predict. 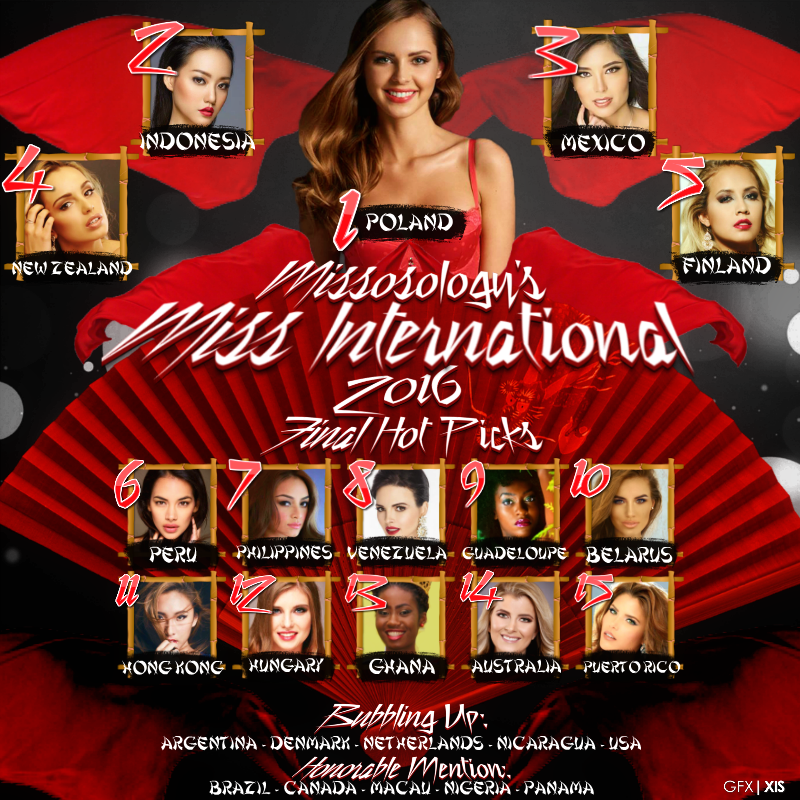 However, Missosology has a team of dedicated beauty pageant experts and correspondents on site wherein their main job is to track the trends and dynamics of Miss International 2016. Interestingly, there has been a consensus among them that Miss Poland, Magdalena Bienkowska, will emerge as the winner. Poland may not be considered a beauty superpower nation but here at Miss International, the country has already three crowns. Magdalena carries that legacy which could help her inch closer to the crown. On top of that, she is a stunning beauty so much so that it is difficult not to be drawn to her even in a room full of other stunning beauties. Will it be win number four for Poland this time? Miss International is unabashedly Europhile especially in the 1990s and early 2000s wherein most of the winners are from Europe. Magdalena embodies that winning European “prototype” with her soft looks, blonde hair and a body to die for. But that is just the superficial side of it. 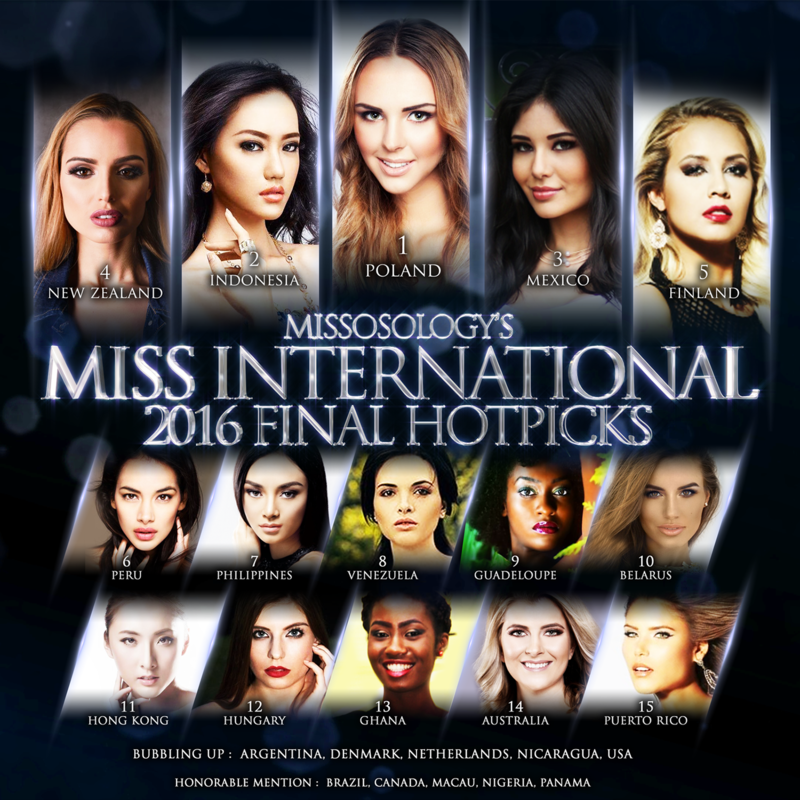 Ask the contestants whom they think is deserving to win Miss International, and the overwhelming choice is Magdalena. Why not? She has a very endearing personality, is very down-to-earth, and is well loved by the locals due to her friendly stature and infectious smile. The second favorite candidate of our analysts and correspondents is Miss Indonesia Felicia Hwang. 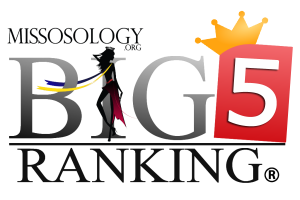 Missosology can attest that this year’s Puteri Indonesia contest (the national pageant where Felicia was chosen) is one of the most competitive ever, largely because there are so many high caliber contestants. In fact, Felicia could easily have won the top plum. Felicia is pretty consistent with her performance. She is elegant, confident and is poised to win her country’s first major international beauty pageant title. This is the kind of international title, one with a great reputation and historical record, that Indonesia deserves to be recognized. Mexico’s Geraldine Ponce completes the triumvirate in our list. 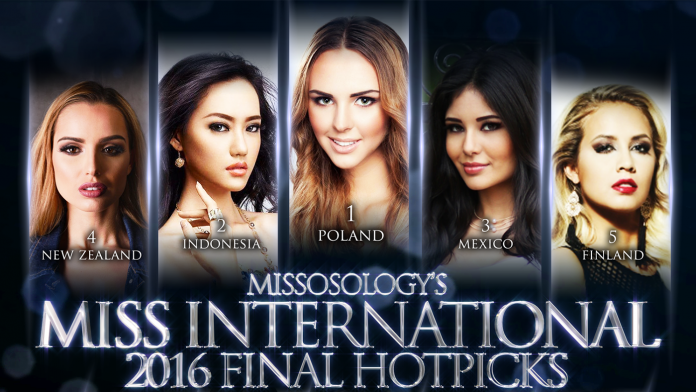 Truth be told that Miss Poland, Miss Indonesia and Miss Mexico are virtually tied when it comes to scores. Any of these three stunning ladies will certainly be worthy to take home the Miss International crown. The statuesque aura and unmistakable Latina flair of Geraldine makes her the candidate who has the best shot to earn Mexico’s third Miss International title to date. On the fourth place is Miss New Zealand Jessica Tyson. This drop dead gorgeous blonde uncannily looks like she’s one of those Victoria Secret lingerie models. She’s pretty much laid-back in her casual candid look (yet still gorgeous) and then she effortlessly transforms into her elegant look when she is all glammed up. Japanese people really love her! Miss Finland Emilia Seppänen comes at the fifth place. What most of pageant experts like about her is her leggy, well-proportioned body form. Her light smile which is simply heavenly along with her curly blonde hair is a big hit among the Japanese fans. And on top of that, Emilia is friendly, always on time and is very polite and punctual. With her kissable full lips, well-arched brows and a pair of scintillating eyes, Miss Peru Danea Panta could easily pull a surprise. Although she is on the sixth place in this list, it is crucial to keep an eye on her! She just came out of nowhere, and now we are having this strange feeling that she might just be the “chosen one” by the organization. At number seven is Miss Philippines Kylie Verzosa. True, she is placed quite low but Kylie is in fact a worthy candidate from a beauty superpower nation. Easygoing, jolly and comfortable in her own skin, there is no doubt that her sash carries a big weight. She could easily win the Miss International 2016 crown and become the sixth Filipina beauty to do so. Once Kylie is on stage, no one can stop her! It is also interesting to note that Bea Santiago was seventh on our Final Hot Picks back in 2013, yet she won it all. Another rep from a beauty superpower also carries a golden sash yet may find herself at a disadvantage. Miss Venezuela Jessica Duarte is very well aware that the current winner is from her country and that no nation has won the Miss International crown two years in a row. Ranked 8th in this list, Jessica may not be consistent but she has all that confidence and poise that every Miss Venezuela possesses. Miss Belarus Palina Tsehalka rounds off the Top 10 with her glamorous, in fact very Hollywood beauty. She is not in the radar of the many but she has the potential to pull a surprise because she always brings positive energy during the competition. Not to mention her amazing wardrobe and great personal style. Miss Hong Kong Kelly Yeuk Lam Chan is ranked 11th thanks to her beguiling beauty. It is that kind of beauty that many Japanese will find appetizing. She is also a poised delegate and given that she has a pleasing body form, it works just well for her. She can speak fluent English and Mandarin. Miss Hungary Csillag Szabó lovely eyes and charming smile won a lot of hearts in Japan. She may need to work more on her poses but she is a strong contender for the semis and thus ranked 12th in this list. If she enters the Top 15, she can change the game with her speech, because this girl is super smart, now studying at Hungary’s very prestigious university for political studies. Miss Ghana Cindy Kofie represents the warming of relationship between Miss International and the sub-Saharan African nations. 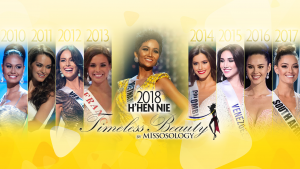 Numerous articles have already been published in Missosology about the alleged racism in the pageant and the fact that many African nations virtually boycotted Miss International. Cindy is the first candidate from Ghana and she gave a strong showing. One can look forward that she may place higher than being 13th in this Hot Picks and hope that she will not be the last from her country. 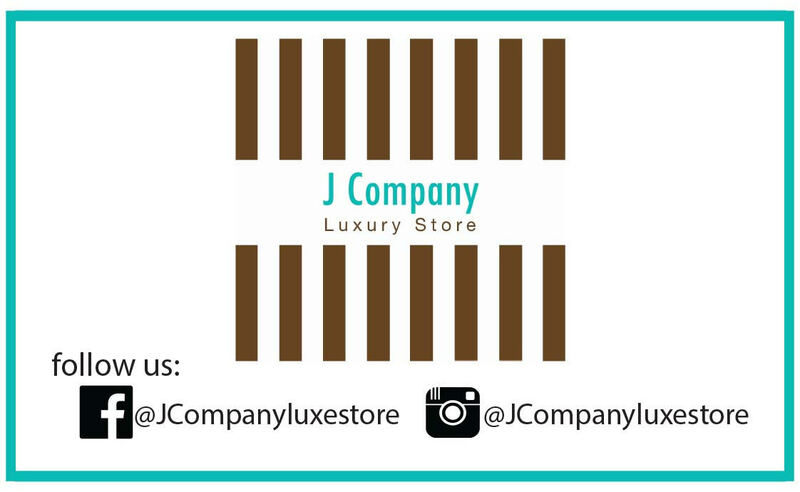 Our correspondent in Japan, though, has high hopes that she will place in the Top 5. Towering beauty that is Miss Australia Alexandra Britton has a strong chance to be in the semis and is a shoo-in for the crown. Let’s say she is a dark horse but her blonde Barbie doll-like beauty certainly puts her in great advantage despite being in the 14th place. Miss Puerto Rico Gabriela Berrios wraps up our Top 15 and she is one heck of an experienced woman in the world of pageantry. That will work to her favor and she is seen now as a more relaxed and confident candidate. Puerto Rican beauties are usually underrated but they thrive when there is less pressure on them. Miss Argentina Yoana Don. A pageant veteran with strong stage presence. Miss Denmark Sara Danielsen. Sweet and caring beauty with a pleasing personality. Miss Netherlands Melissa Scherpen. Young, talented and very friendly. Miss Nicaragua Brianny Chamorro. A great speaker and has been considered a dark horse. Miss USA Kaityrana Leinbach. Cute and is full of youthful vibe! Miss Brazil Manoella Alves. Blonde bombshell, but is very quiet during the activities. Miss Canada Amber Bernachi. Another great spokesperson, but is too short. Miss Macau Sulin Ip. Great personality, but is sometimes overshadowed by her counterpart from HK. Miss Nigeria Ivie Mary Young Akpude. Michelle Obama lookalike, but needs to improve her poise. Miss Panama Daniela Ochoa Barragan. Always ready with a winsome smile, but still lacks the maturity.